Curry has been voted one of Britain’s favourite dishes. We all love a good curry, especially come this time of year when the weather starts to turn cold, but it’s far too easy to fall into the habit of always having the same dish, instead of venturing into the unknown and trying something new. So, in honour of National Curry Week, it’s time to try something new! This particular curry called Khao Soi comes from northern Thailand. Rather than the typical thick curry paste, this one is more of a soup-like consistency, and has tempting deep-fried crispy noodles over the top. 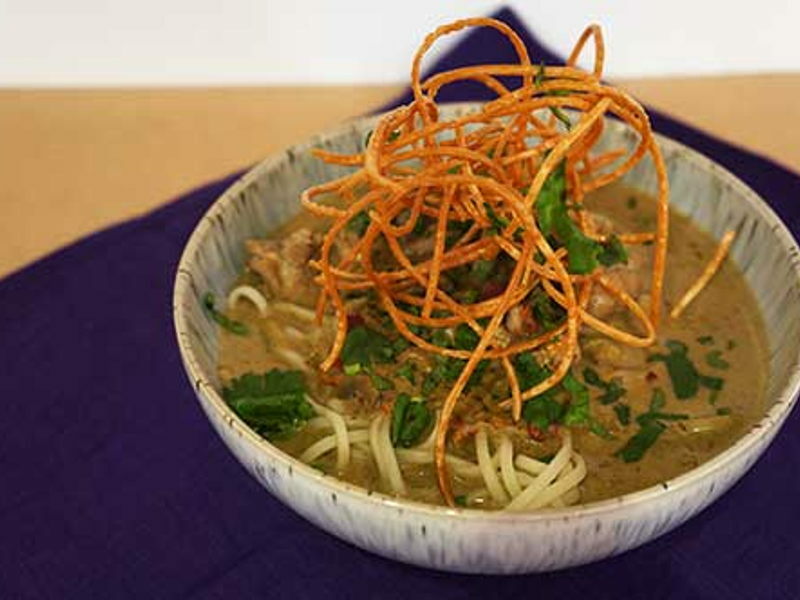 There are many versions of Khao Soi, as they differ from family to family, depending on what meat is used or sauces and condiments served on the side. This version below used chicken, but feel free to play around and substitute in whatever your preference! Method In a large saucepan or wok, heat the oil for frying. At the same time boil a pot of water to cook the noodles in. Once the oil it hot enough (you can test with a wooden wooden chopstick. When the tip sizzles it’s ready!) Take 50g of the dried noodles and deep fry them until crispy and slightly bubbled, approx 3-5 minutes. Cook the rest of the noodles in the boiling water for 2-3 minutes. Drain and separate into 2 serving bowls. In a wok, heat 1 tbsp of vegetable oil over a medium high heat. Add the chilli paste and fry until fragrant. Add the curry paste and cook for 1 minutes before adding the liquids. Coconut milk, vegetable stock, lime juice and fish sauce. Bring to a boil and add the chicken pieces. Lower the heat and simmer for 15 minutes until the chicken is thoroughly cooked and tender. Ladle the rich broth over the noodles in the bowls, along with the chicken. Top with the crispy fried noodles and roughly chopped coriander and serve.